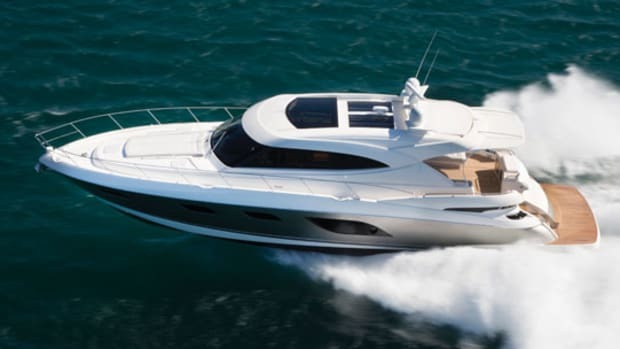 When Riviera Yachts announced plans to premiere a 36-foot sport cruiser at last year&apos;s Fort Lauderdale International Boat Show, I didn&apos;t know what to expect. 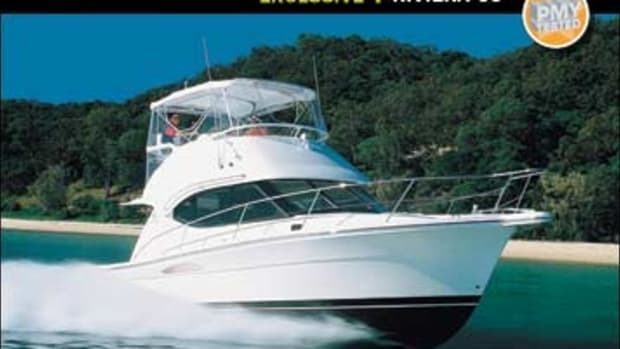 Because of the success Riviera has enjoyed stateside with its convertibles, I was keen on investigating what direction the Aussies would take to contend in a hotly contested cruiser field. 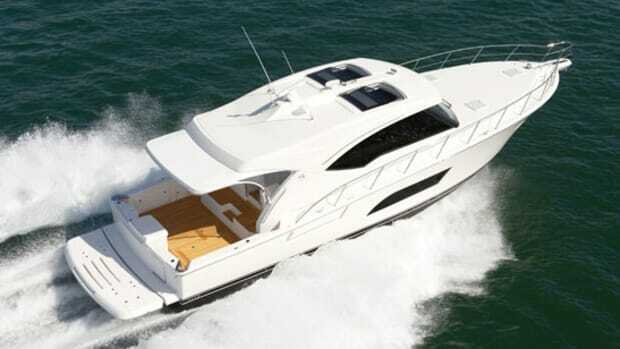 So when I got an invitation from Riviera&apos;s director of marketing Scott MacFarland to sea trial the 3600 Sport Yacht a few weeks after the boat show, I quickly accepted. I met MacFarland in Coral Gables, Florida, where the 3600 sat behind her new home—she&apos;d been sold the day she premiered. 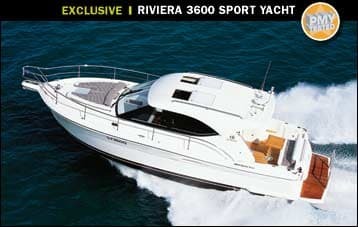 As I loaded my gear onboard, I asked him why Riviera would plunge into the crowded cruiser market. "Our demographic is aging, and an increasing amount of older folks don&apos;t want to be climbing up and down ladders and steps all the time," MacFarland said. He went on to explain that it was how Riviera addressed this need—"one-level living" is how he put it—that would set her apart from the competition. He&apos;d piqued my curiosity. 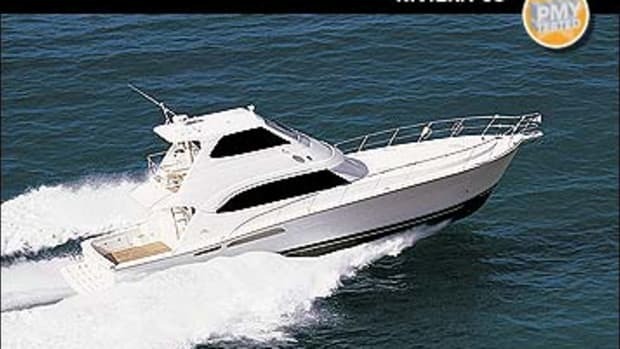 I boarded the 3&apos;2"-deep swim platform, stepped through the starboard transom gate, walked across the standard teak-soled cockpit, and entered the saloon through a glass and stainless steel door. MacFarland followed, and as I set up my gear, he went to work. He opened and latched the aforementioned door, then opened the glass to port of the door and latched it firmly to the hardtop. 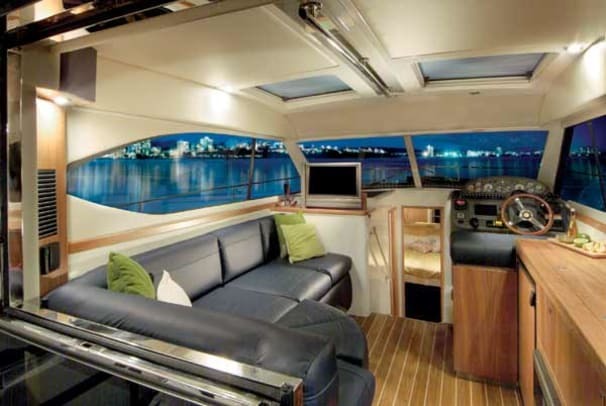 Next he slid open two 30"L X28"W Lewmar hatches in the saloon roof and the port and starboard windows. In less than a minute, MacFarland had changed the saloon from an enclosed area ideal for avoiding inclement weather to an open-air space that flows right into the cockpit. Such flexibility opens up a wealth of possibilities. On hot days, simply close her up and crank up the standard 16,000-Btu Cruisair air conditioning. 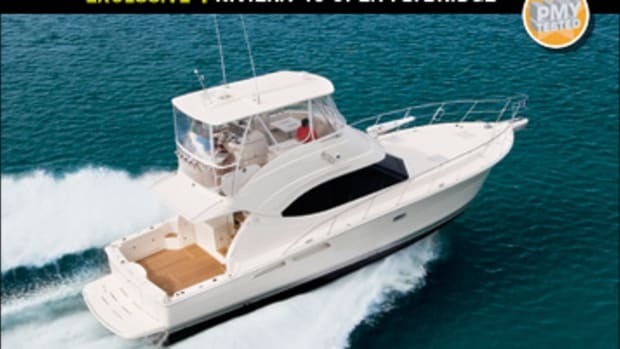 There&apos;s room for five on the port-side, L-shape settee, and if they get hungry, the adjacent galley is up to the task, with its one-burner cooktop, microwave, and refrigerator-freezer. Forward and to port, a standard 26-inch Sony Bravia LCD TV rises electrically from a cherry cabinet; the aforementioned settee provides the perfect viewing angle for watching DVDs. On more pleasant days, you can open her up to the elements, as MacFarland did. In this guise it&apos;s not hard to imagine that the 3600 will be an exceptionally capable entertainer, especially on the hook. Guests can choose a shady seat in the saloon or lounge in the sun on the cockpit settee and still easily interact. I particularly liked the flexibility of the cockpit settee and standard teak dining table. Open the table, and as many as six can sit on the settee and a few folding chairs, dine alfresco, and watch the big game on the saloon TV. Lower the table courtesy of its gas-assisted Besenzoni pedestal and add a few cushions, and you have a sunpad for two. To make sunbathing even more enticing, there are speakers here for the Clarion AM/FM stereo/CD player as well as in the saloon, and the standard fridge-freezer is within arm&apos;s reach. But I wasn&apos;t interested in sunbathing. I wanted to see the engine room, accessed via a hatch in the cockpit sole. I found the space rather cramped. After I descended a narrow ladder, the 3&apos;4" headroom had me crouching uncomfortably. There&apos;s just nine inches between the QSB5.9 330s and the aluminum-face, melamine foam-lined headliner, which makes getting to the injectors a challenge, as it&apos;s difficult to get both tools and hands in such a narrow space. Outboard access is also a challenge: I had to crawl over the exhaust to get there. MacFarland told me that future models would have an additional hatch in the cockpit sole to address the outboard access issue. On the plus side, a 1&apos;9"-wide walkway between the powerplants allows access to all regular service points, the standard 5-kW Onan genset is easily serviceable, and the engines&apos; Racor fuel-water separators are on the aft bulkhead, where they can be eyeballed from the cockpit. I found driving the 3600 a lot more enjoyable than rooting around in her engine room. 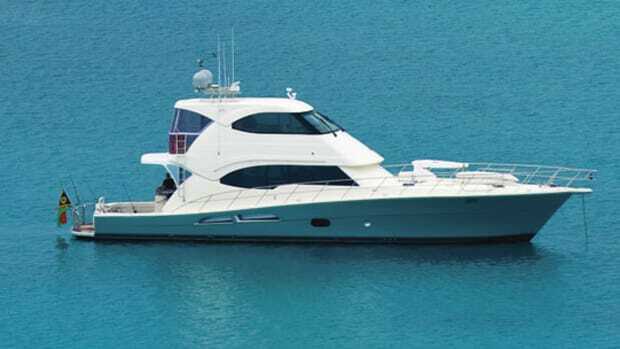 She has the same Frank Mulder-designed hull as Riviera&apos;s 33-foot convertible. Prop pockets reduce her draft to 3&apos;3" and reduce the shaft angle, which reportedly improves performance. The package turned in an athletic performance on a calm Biscayne Bay: She was on plane in five seconds, on her way to an average top speed of 30.9 mph at 2960 rpm. 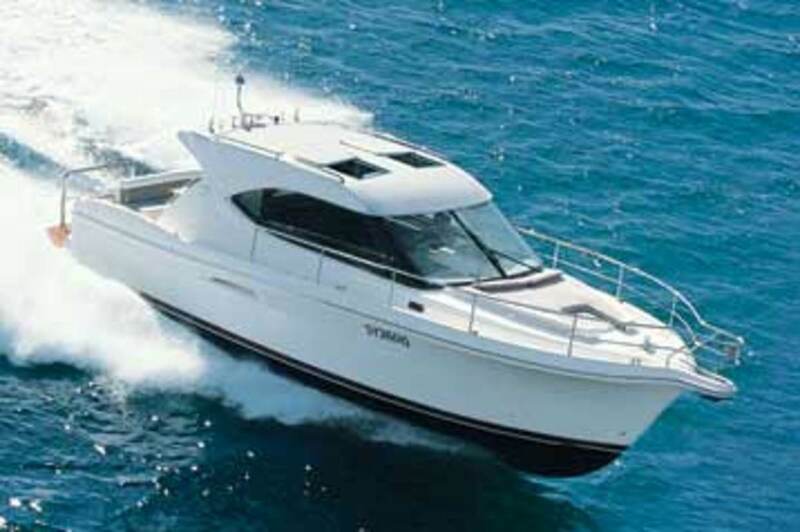 Full-speed turns took fewer than two boat lengths with only a slight drop in rpm (less than 150). After I backed her off to 2500 rpm, the 3600 cruised at 25.4 mph, a speed that yields better than 1 mpg and a 280-mile range. Sightlines were excellent in all directions and at all speeds. 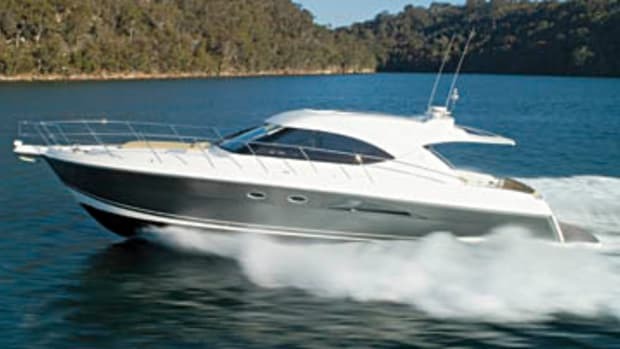 So will the 3600 Sport Yacht follow in the successful footsteps of Riviera&apos;s convertibles? After spending time aboard her, I&apos;m betting yes. 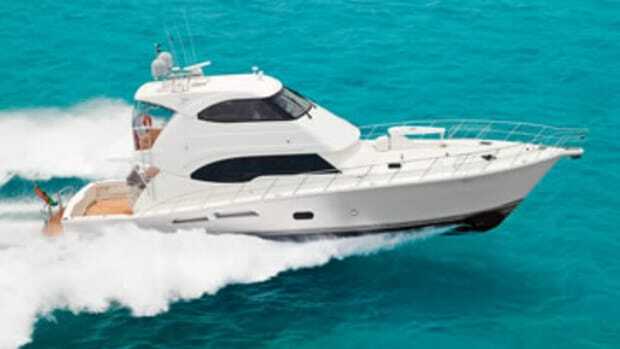 She offers accommodations for four in her two staterooms and a respectable cruising speed, all in a handsome package. But it&apos;s that single-level living space that sets her apart. I&apos;m betting it&apos;s this feature that will let the 3600 put up the kind of sales numbers that will not only match but maybe even rival her convertible kin. 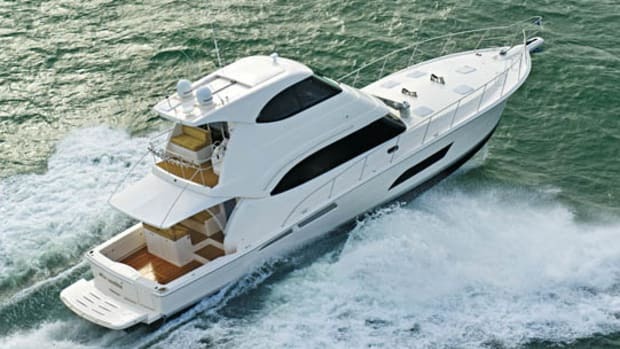 For more information on Riviera Yachts, including contact information, click here.